It is 2018 and although we’ve already accepted that cloud computing will not fully replace the IT datacenter, we are still discovering how the rise of IoT will consume cloud computing vs edge computing vs the datacenter. First, though, let me define cloud, IoT, and edge computing in the context of this discussion. Cloud computing, in this context, refers to internet-based computing services such as (but not limited to) AWS, Azure, Google Cloud Platform, and others. These are cloud computing resources than can be used to extend the computing resources of a datacenter and, in some cases, replace the computing resource needs of remote sites. Cloud computing may also include the use of cloud-based applications. IoT is the proliferation of micro-computing devices that are sending data to centralized computing resources for processing and analytics. IoT can encompass nearly any kind of computing device from a common personal device like a phone or tablet to a camera or GPS on a drone or to a sensor on a piece of manufacturing equipment. Edge computing is anywhere outside the datacenter where cloud computing cannot replace on-prem computing needs. Think of a mobile platform like a large ship or mobile oil/gas platform, a remote medical facility, a manufacturing facility, or a retail location. These sites may not have reliable enough internet connectivity to cloud computing to ensure the quality of service they require for on-site computing needs. Ok, now that we have the definitions in order, what does it all mean for IT? Well, I’ll give you the age old IT answer: It depends. There are too many scenarios to cover but we’ll start by saying that for any given scenario, there will likely at least two of of these three types of computing involved. Let’s talk about a three examples where these different types of computing might be combined. Probably the easiest example where cloud computing and edge computing are combined would be retail. Many retail operations include a combination of online sales and brick-and-mortar stores. The online sales component is often cloud-based where the brick-and-mortar operations require on-prem system that also connect with the online systems. A single store operation does not really meet the definition of edge computing since the one store, no matter how modest the computing systems, would be considered the datacenter, however larger operations with multiple store locations and a centralized office/datacenter would definitely meet the definition. Retail locations might use a combination of cloud and edge computing for a number of different functions but often it is desirable to have highly available, on-prem edge computing to make sure key point-of-sale systems are functional and PCI compliant even if internet is not. Connection to cloud-based applications or VMs may also be needed for store operations that are less sensitive to outages. IoT may also play a role in retail with digital devices in the hands of store associates, point-of-sale devices, security systems, or maybe even smart sensors on things like refrigerated cabinets. When it comes to managing large areas of land, the limits of traditional networking come up short. Farmers are increasingly using IT to manage farm operations and a device or sensor on a piece of farm equipment in a field a mile away is probably going to be out of range of a wifi router but not a cellular tower. This is where IoT can intersect with cloud computing beyond the reach of on-prem infrastructure. Transmitting and analyzing data from the literal field can increase operational efficiency in agriculture and this can only be achieved in real-time by internet connected devices. Unlike with some other industry operations, a break in internet connection to the cloud will not cause crops to stop growing and probably not stop farmers from plowing, planting, or harvesting, but when connected, the data can help perform these tasks more efficiently. There are also scenarios where edge computing also fits into agriculture. For example, a dairy farm may have hundreds of sensors connected locally for monitoring milk production where data is collected on edge computing systems and then also sent on to the cloud for data analysis. There are no hard and fast rules on which technologies to use where, but rather simply choosing those that can do the job most effectively. Manufacturing processes can range from extremely hazardous to fairly benign. A system failure or a loss of production can be extremely costly whether it leads to a life threatening accident in a steel mill or 10,000 diecast fasteners that don’t fit. Manufacturing sites need reliable computing power to manage complex modern computing processes and these processes can include hundred or thousands of sensors or other IoT devices for both safety and efficiency. Whether wired or wireless, these networks of sensors and devices require real-time monitoring and data processing where the cloud can’t quite fill the need. To maintain reliable production schedules, production facilities need reliable on-prem, edge computing resources that can gather IoT data and maintain the pace of production. These edge computing systems may also go on to send their data up to the cloud for further processing but they are still vital to maintaining production on the ground when network latency to cloud systems can be an issue. These three examples are just a few of the many IT environments that will combine cloud, IoT, and edge computing. Nearly every organization will have IT requirements now or in the future that encompass some or all of these infrastructure technologies. Cloud, IoT, and edge computing all have very real and critical roles to play in both modern and future IT infrastructure. While their roles will continue to evolve, it is clear that each is a growing part of the IT industry and hybrid IT infrastructures that adopt and combine these different technologies will have a competitive advantage over those who do not. Just as these technologies continue to evolve, so will the ways they’ll continue to intersect. This is not the first time I have blogged about winning awards at the Midmarket CIO Forum. Our midmarket customers and their peers seem to just naturally recognize the value of our infrastructure solutions. So maybe it isn't too surprising that when the Midmarket CIO Forum introduced a new Best of Show award this year, Scale Computing came out on top along with a win for Best Midmarket Strategy. I've been in the IT industry for 20 years now and have been involved in many award submissions over those years at all levels of the industry. I've also been in meeting and involved in projects designed to help win awards. If I have learned anything in those years, it is that setting out to win an award is a losing strategy. The only time I've been involved in award-winning solutions is when the only objective has been to provide a great solution to customers. The concept of winning in IT should go no further than making IT easier to implement, easier to manage, and cost less. That is what we strive to do at Scale Computing. The fact that we are recognized by industry CIOs is just icing on the cake. We understand you may still not be convinced that HC3 can be so easy-to-use and so flexible that it can meet and even exceed your IT infrastructure needs. If not, join us on our weekly live demo and see for yourself why HC3 is everything we say it is and more. Click below to choose your demo time and date. While the HC3 UI currently only allows exports to be submitted immediately (and remember they are done from a snapshot so it's fine to export a running VM), the ScaleCare support team can and will set up simple scheduling of VM exports for you using some "under the hood" tools, even giving you some control of which VM's are exported using "tags" you can add and remove in the HC3 UI and storing batch VM exports in a date stamped directory name structure on said SMB file share... hmm, guessing most of you can see where this is going. Well there are a lot of different directions you might go with this depending on your needs. Could these vm export files be considered an extra level of backup? sure! We have customers using monthly, weekly or even nightly scheduled exports as that. Could these exports be retained for long periods of time, even many years? Absolutely, and unlike just data backups or archives these are fully bootable VMs with not just the data but the right version of the OS and applications required to access and process that data. Where might you keep these export files? Well there is all sorts of deep and cheap budget NAS storage available, not to mention roll your own software solutions using commodity hardware if you want to go that route. I've heard of other customers using their "old" / retired production infrastructure (servers and storage) to house this export repository. Some other things I've personally played around with include storing exports on a Windows server VM with the built in file system de-duplication enabled. Obviously if you are storing lots of versions of the same VM and are able to deduplicate at a sub file level you could see very high deduplication rates. I've also played around with using cloud storage to achieve high capacity / off-site long term retention and will likely post more about some of these solutions in the future. From "file servers in the sky" to cloud storage gateway solutions available in the market, many that could run as virtual appliances right on your HC3 system. Further, there are all sorts of low level tools to simply copy files from ground to cloud where an admin could script some of that ... for example I've used azcopy . Although the AWS Cloud Storage Gateway only exposes storage as NFS and iSCSI, and is only released as a VMware VMDK or Hyper-V VHD, I have converted and run those virtual appliances on HC3 to provide a local gateway to AWS S3 cloud storage ... hopefully AWS will fully support a native KVM version soon since they are converting their whole EC2 cloud back end to use KVM as the hypervisor. Let me begin by stating, I'm no docker / containers expert but we've been getting an increasing number of questions about containers on HC3, as well as an increasing number of customers actually using containers in production so I wanted to gather up some information, try some things out myself and begin a discussion here. For years, you have been able to run linux based containers (using docker and LXC) inside linux VM's running on HC3. Nothing really fancy and there are all sorts of guides on docker out there. But high level, on Centos7 for example - simply su "yum install docker" then su "docker run hello-world" to run your first container. So Linux based containers on Linux VMs running on HC3 - check! 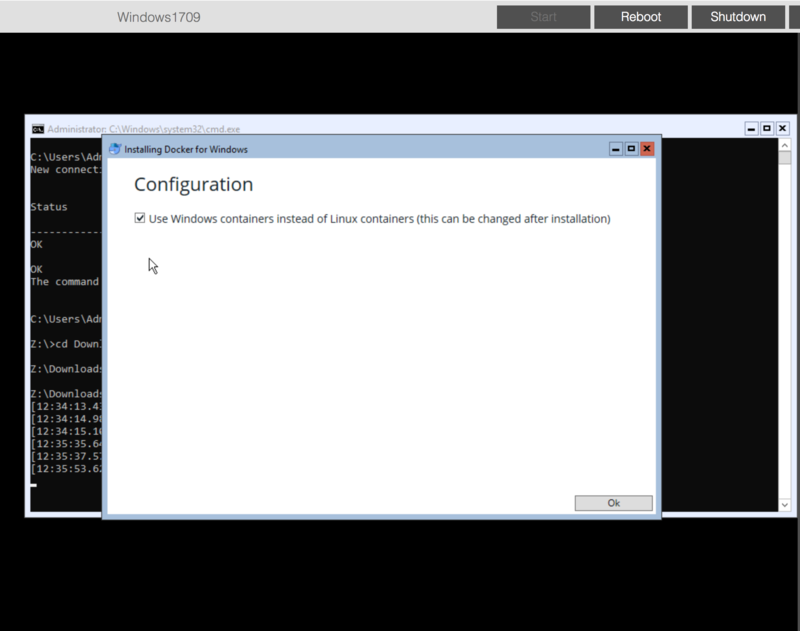 However, Microsoft recently introduced the ability to run Windows based containers (windows binaries) using Windows Containers feature in Windows Server 2016 and Windows 10. We've had a few people ask about it or try it inside windows VM's running on HC3 and have heard mixed results generally installation or the believe that nested virtualization (VTx) inside the VM was required. In my initial testing, I myself also saw mixed results but I believe I've "cracked the code" to running docker for windows images, on Windows VM's running on HC3. 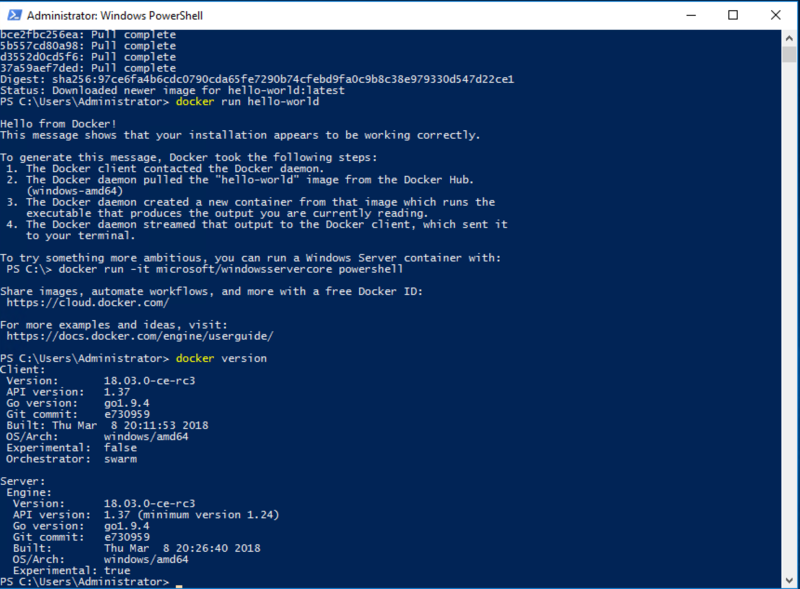 tl/dr: docker for windows needs the windows OS to have a virtual switch configured, which is a component of windows hyper-v role... if it's not installed it will try to install hyper-v ... appear to work but not really (and actually can pretty badly mess up windows so don't do this on production VMs! use snapshots, test, etc.) If you try to install hyper-v using the add roles / features wizard inside a HC3 VM - it will complain that the CPU isn't VM capable because we don't pass the VTx flags into the guest OS (by design). The workaround seems to be to install the Hyper-V role using DISM (which doesn't seem to check the CPU flags), then configure a virtual switch (using either powershell or Hyper-V manager GUI), THEN install docker for Windows (selecting the option prompted to use Windows Containers). I'll give some steps and screenshots below. One capability available to windows containers on physical machines is instead of sharing the same base windows kernel, to launch a new kernel inside a hyper-v VM for greater isolation (also known as hyper-v containers.) Attempting to start a container with the --isolation=hyperv flag fails because that "level 2" VM can't be created using hyper-v. Trying to run Linux based docker containers on Windows also fails with various messages as expected. If you've ever imported a large amount of data to a HC3 Tiered node cluster (a cluster with nodes containing SSDs), you've likely noticed an odd behavior. During data import the SSDs gradually fill up much faster than any HDDs, but then their utilization goes back down seemingly on its own over time. Why? On a tiered cluster all new writes to virtual disks by default go through the SSD tier in order to improve performance. As blocks are determined to be hot or cold (highly active or relatively dormant) they are tiered accordingly and will either remain on SSD or will be moved down to the HDDs. This default behavior of prioritizing all writes to SSD may not be desirable for large data migrations to the HC3 cluster. It is possible to circumvent the behavior by setting the SSD priority level (the HEAT Priority in the HC3 web interface) for the virtual disk to 0 during the data migration. When a HC3 virtual disk's HEAT Priority is set to 0 all new writes on the virtual disk by default will be written to the spinning disks, bypassing the SSDs. Once you are finished with the migration change the SSD priority to the desired level and the cluster will automatically detect the hot or cold blocks and begin tiering them appropriately. You’ve no doubt read countless blog posts or marketing emails that have tried to market you some IT product or solution. Also, you are not a mindless consumer so you have an idea of how these pieces of marketing content work. This is no exception. This introduction is the part of the post where I, as a content marketer, try to appeal to your emotions and get you hooked into reading more. I might likely say something like, ‘This week was the official start of the Spring season and we can now look forward to some warm weather, green trees, and outdoor fun!’ You know, something positive that almost anyone can relate to who lives far enough away from the equator. This is also the part of the post where I talk about some problem you likely have as an IT professional or IT organization. I might tell you some aspects of IT infrastructure are too complex, or that they are too expensive, or that you spend too much valuable time performing mundane tasks. Any or all of these is likely true to some degree and you would likely want to know more. I’d next focus on one of these problem topics in more detail, explaining further how it may be affecting you personally. Let’s say I focus on complexity in infrastructure. I’d probably go with an assumption that you have a VMware virtualized environment with at least some servers and a SAN or NAS appliance. Fairly safe guess, right? Even if you don’t, I’m pretty sure you’ll know what I’m talking about. It is an extremely common IT infrastructure setup so why is it a problem, you may wonder. The truth is that you are already aware of the problems, although you may have taken them for granted. Therefore, it is my task to point them out to you. I’ll likely mention that your servers, storage, virtualization, and even disaster recovery solutions may all be from different vendors and as such, you have multiple sets of patches and updates to apply independently, multiple support organizations to work with, multiple maintenance contracts and license renewals to deal with, and lots of chances for these technologies to conflict. I might also talk about how difficult it can be to implement and integrate these different vendor solutions, or how the level of integration makes it hard to scale out or scale up. I might appeal to your emotions about how many nights and weekends you lose to work because of system patches and updates or needing to upgrade, replace, or scale out existing infrastructure. The more I talk about it, the more likely you are to realize how these problems may apply to your organization or you personally. My favorite part of the post. This is the part where I tell you that there is an answer to your problems and it is our HC3 solution from Scale Computing. But I am not going to do that this time. As true as it might be that HC3 will solve many of your IT infrastructure problems, it is just more effective for you to see it for yourself on a live demo or hear for yourself from one of our customers through a case study or through a personal customer referral. While it may be my job to market to you in this kind of format, sometimes it is just easier to let the product, backed by the hard work of our dedicated product, development, and support teams, speak for itself. After all, you don’t want to waste time being marketed to. You just want IT solutions that will make your organization more successful and make you an IT superstar. Awesome, that's what we like to hear. Let me see what I can do. "Though they have different pressures and market demands, small and midsized insurers aren’t ignoring the rapid digital transformation sweeping the insurance industry. Idaho Farm Bureau is in the midst of upgrading the company’s IT infrastructure and core systems, initiatives that are allowing the multiline P&C insurer to glean insight and improve the customer experience using next-generation digital tools like drones, smarthome devices and geographical information systems (GIS). CIO Adam Waldron says that the company was looking to set up a hot disaster-recovery site when it contracted with Scale Computing’s HC3 for server, storage and virtualization. Now that Scale is up and running, the company is able to leverage the investment to support advanced digital efforts. Scale integrates with Google Cloud Platform to allow customers to tap into additional storage and running environments at the same time it continues to work on-premise.